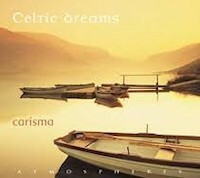 Comments: I received carismas Celtic Dreams cd that I won in Junes contest, and I love it. I was pleased to find out that I recognize many tunes, even if I dont know the words. Such is the nature of Celtic music, yes? Suo Gan played on Highlander a few days before the contest, and when I figured out that I would be home to compete I decided to choose the cd by carisma. So its here, and Ive listened through a few times. I love Suo Gan, like many people the first time I heard it was in the movie Empire of the Sun. carismas version uses the voices of the harp, then the cello, and finally the flute to calm and soothe  its beautiful. I was surprised to read in the album notes that Morning Has Broken is a traditional Scottish tune! Cat Stevens is one of my all time favorite musicians, and I always thought he had written the tune and the lyrics. Bless those liner notes, thats why I still like to get the hard copy of the cd. I also really like the first track, Brian Borus March. I enjoy the march rhythm of the percussion on this song  OCarolans Concerto is another upbeat piece. One of the tunes that was not familiar to me, its from a more contemporary Scottish composer, is Water Shore Sound. It is also a beautiful song, and the guitar that is featured is excellent. Comments: I just won the cd, YAY!! So after it arrives and I've had a chance to listen a few times, I'll be back with comments. I love Sua Gan and the others I've already heard here. Write about Celtic Dreams - carisma! Want to write a review about carisma's Celtic Dreams - carisma album? Post your comments in this box to be displayed in our community forums and in our album database! Please make sure you are logged in before proceeding. Please login to write your comments about Celtic Dreams - carisma.